Summary: A young girl sees a beautiful green bike in a store display window and sets about earning the money to buy it. In the process she meets a kindly neighbor who helps make her dreams come true. 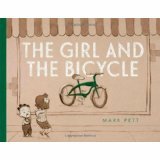 Literary elements at work in the story: This is a completely wordless book, so Pett’s pencil and watercolor illustrations bear the entire storytelling responsibility. The plot line is simple: girl sees shiny green bike; girl looks for loose change with which to purchase bike; girl raises money with a lemonade stand, a yard sale, and eventually chores for a neighbor; girl finally has enough money. A crisis occurs when the girl discovers that the bike is no longer in the store window. Although the reader has learned a lot about the protagonist’s gumption and determination in the early pages of her money-raising adventures, it is at this critical juncture that we learn what she is really made of. She sits dejectedly on the sidewalk outside the store, while her little brother plays with a toy bike and a bug. There is no cartoon lightbulb-over-the-head moment, but when we see her attention shift from her own disappointment to her little companion, we know that love is at work. She heads into the store and comes out with a tricycle for her brother, who is overjoyed with the unexpected gift. The story could have ended here, and all would have lived happily ever after, no doubt. Sometimes, though, stories end even better than good enough. On their way home with the new trike, the girl and her brother pass the neighbor for whom the girl has been working, and she points to her back garden, where the longed-for green bike awaits, bedecked with a bow. How does the perspective on gender/race/culture/economics/ability make a difference to the story? The protagonist is female and is self-reliant and working out her own way in the world. Otherwise, these issues have little bearing on the story. Theological Conversation Partners: The prosperity gospel to the contrary, good works and right living do not necessarily result in outcomes that we want. We have only to look at the life of Jesus of Nazareth for an example: despite his holy life, Jesus was misunderstood, rejected by his neighbors and betrayed by his closest friends. While The Girl and the Bicycle does not tell a story so drastic as Jesus’, the protagonist’s determined hard work is met with disappointment rather than with success. Despite this disappointment, however, this girl demonstrates a veritable cornucopia of the fruits of the Spirit – self-control and faithfulness when she sees that her longed-for bike is gone, and, eventually, kindness, generosity, and love when she makes the decision to buy a present for her brother instead. Though wordless books are hard to use with a large group, this story would be a good one to share when talking about what life in the Kingdom might look like. Every reader will rejoice that the little girl does get her bike in the end, when her lovely neighbor presents it to her as a surprise. The little girl sails off happily on her beautiful bike, but like the one leper in Luke’s story of Jesus and the ten lepers (Luke 17:11-19), she suddenly remembers the proper response to grace: she drops her bike in the grass and returns to give her benefactor a big hug. Name some of the things that the girl in this story did to earn money to buy the bike she wanted. How many days do you think it took to raise the money? The girl and her neighbor worked together on a lot of projects. How do you think they felt about each other? How do you think the girl felt when she saw that the green bicycle was gone from the store window when she went to buy it? List all the things you can think of that might have been going through her mind. Why do you think that the girl bought her brother the tricycle? What do you think that God would have wanted her to do? Would you have done that? Why or why not? Why do you think that the neighbor gave the girl the bicycle she had been wanting? Why do you think the last picture shows the girl giving her neighbor a hug? The Girl and the Bicycle by Storypath is licensed under a Creative Commons Attribution-NonCommercial 4.0 International License.